Micromax Canvas Turbo will be first company Smartphone to feature full HD 1080p display. The display size will be 5 inch same as that of Canvas 4. With 1080p display you get the highest resolution and better contrast which results in better quality picture than 720p. Micromax Canvas Turbo is powered by 1.5 GHz Quad Core MT6589T Processor and PowerVR SGX 544MP GPU. There is a bit of upgrade in CPU as compared to the company previous flagship smartphone. The RAM is still unknown and expected to be 1GB/2GB RAM. 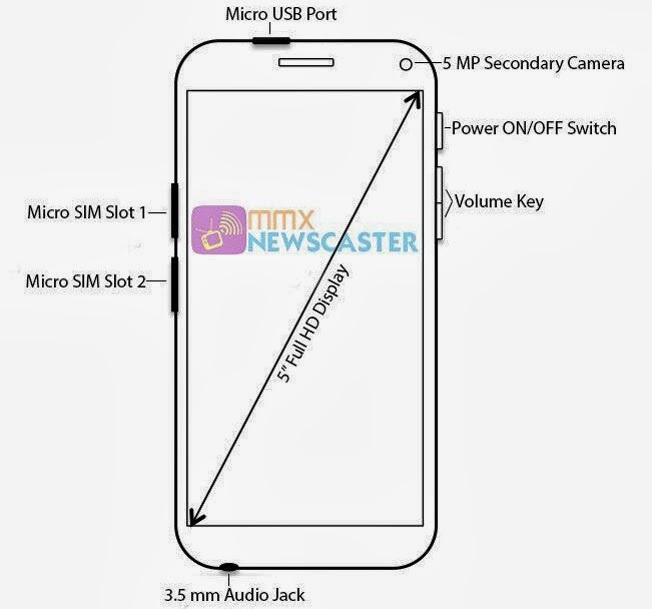 The front camera of the Micromax Canvas Turbo is confirmed to sport 5MP camera as per MMXNewscaster tweet. The primary camera is likely to be 13MP. Micromax Canvas Turbo will run on Android 4.2.1 Jelly Bean operating system which soon be upgraded to Android 4.3 Jelly Bean along with other Canvas phones. Canvas Turbo might get LTE support or might not. We need to wait until it’s official to confirm LTE connectivity. Just like other Canvas phones there will be GPRS, EDGE, 3G and Wi-Fi support. It will be dual SIM (GSM + GSM) expected to feature 16GB internal storage and 2500mAh battery. Thanks to MMXNewscaster for sharing this Micromax Canvas Turbo sketch on twitter. The sketch shows the design of the phone and reveal some feature 5MP front camera and dual SIM. Considering the specs Micromax Canvas Turbo is likely to get price around Rs 20,000. Diwali is what seems to be Micromax Canvas Turbo release date. So most probably between 1 November 2013 – 4 November 2013 Micromax will launch Canvas Turbo Smartphone in the market. Yes you read it right, the Canvas Turbo website is official and you can visit it here. Hugh Jackman a Hollywood actor best known for X-Men and The Wolverine is the brand ambassador of Micromax Canvas Turbo. Micromax Canvas Turbo A250 is a smartphone with high speed processor. It has brilliant camera quality and phone is full HD making it more attractive. It has ample storage memory to store every important data of the user. It is a good phone for both business and personal purpose.